about half the size of a DSLR. Small Camera + Big Sensor = Amazing Pictures. Share and Save Instantly. Full HD Movies. With 13 times the area of the typical point-and-shoot image sensor, APS-C sensor size makes the difference between “snapshots” and “photographs.” This is the same HD sensor format that Sony builds into the full-sized α DSLRs. Capture HD Movies in your choice of super-smooth 60p, standard 60i or cinematic 24p, all at Full HD 1920x1080 resolution.1 AVCHD™ codec delivers stunning picture quality. MP4 codec offers smaller files for easier upload to the web. Sony’s advanced Fast Hybrid AF combines two technologies for outstanding performance: Phase detection auto focus for quick response that is ideal when tracking fast-moving subjects and contrast-detection auto focus for added precision. A perfect match that delivers optimal Auto Focus for fast, precise focusing in any scene. Compatible with Sony’s wide selection of E-mount series of smaller, lighter lenses designed specifically for compact interchangeable lens cameras. Open up a world of endless creative options. Also, using an optional adapter accessory allows you to use an even wider assortment of A-mount lenses. The NEX-5R is equipped with a tilt-able LCD screen that flips up 180-degrees without sacrificing the compactness for which the NEX5 Series is renowned for. This makes taking great self-portraits incredibly easy since users can precisely compose shots, choosing to include people or objects in the frame for more satisfying results. incredible entertainment quality. Explore the full range of features and options below. 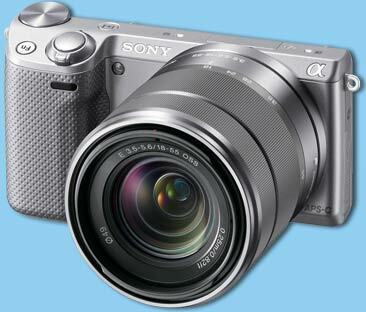 The same sensor format that Sony builds into the full-sized α DSLRs. With 13 times the area of the typical point-and-shoot image sensor, APS-C sensor size makes the difference between “snapshots” and “photographs,” delivering an exceptional combination of high resolution, high sensitivity and gorgeous, blurred backgrounds. Compatible with Sony’s wide selection of E-mount series of smaller, lighter lenses designed specifically for α compact interchangeable lens cameras. Open up a world of endless creative options. Utilizing Sony’s exclusive By Pixel Super Resolution Technology, Clear Image Zoom increases the effective focal length of your lens up to 2x by digitally magnifying the center of your image with nearly imperceptible degradation. It virtually doubles the effective focal length of whatever lens you’re using providing greater shooting flexibility. Multi-interface Smart Accessory 2 terminal greatly expands the connectivity options such as external flash units. Some cameras in this class are slow to focus. That can make you miss the shot on fast-moving subjects like sports and unpredictable subjects like pets and babies. Sony’s fast Contrast Auto Focus system typically takes as little as 0.3 seconds and also offers continuous Auto Focus when shooting movies. Captures a smile the moment it happens. Simply select the Smile Shutter™ mode and the camera takes the picture automatically. You can prioritize children or adults and adjust the smile sensitivity. For cost-effective, convenient storage and sharing of your images, the camera accepts Memory Stick PRO Duo™/Memory Stick PRO-HG Duo™ and SD/SDHC media (Class 4 or higher recommended), (Memory card is required, all are sold separately).